The Er:YAG (Erbium-doped Yttrium Aluminium Garnet Laser – wavelength 2940nm) is the older of the erbium lasers, being an all-tissue (hard and soft tissue) laser. The majority of the literature, when discussing erbium lasers, tends to be about the Er:YAG laser as this has been in existence for far longer. However, due to the similarity in wavelengths and while there are subtle differences, the tissue interactions are essentially the same and therefore both the Er:YAG and Er,Cr:YSGG have been found to be the most favorable for their use in the treatment of periodontal diseases, and actually more favorable than the findings with soft tissue lasers. 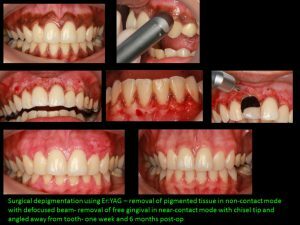 This laser is an all-tissue laser – which means it can be used on both soft and hard tissues effectively, through a range of treatments, from gingival re-contouring to bone removal and root amputations. Its chromophores are water and hydroxyapatite, having a greater absorption in water than the Er,Cr:YSGG, which is why there are some differences in tissue interaction and management as outlined later. Due to its high absorption in water, its penetration depth through the tissues is very shallow (only 1um), which gives the user a great deal of control, and less potential to cause harm so quickly. However, at the same time, while there is some bio-modulation that inevitably occurs through the transference of heat into the tissues, the low level laser effects are almost negligible compared to the deeper penetrating wavelengths of diodes and Nd:YAGs. Delivery of the laser energy is through a flexible fibre or articulated arm depending on the system being used, into a handpiece which makes for easy manipulation around the mouth. In most cases, tips are inserted into the handpiece (that essentially looks like a traditional turbine handpiece used in dentistry). This is where one of the major differences will be found in comparison to the Er,Cr;YSGG in that there are several manufacturers of lasers with this wavelength, and each will have different tips, difference shaped and designed handpieces, and different manipulations of parameters including pulse widths, frequency, power, energy, air and water settings. Variations of any one of these parameters can result in a slightly different tissue interaction and biological effect, or may affect speed, accuracy or smoothness of cut. The Er:YAG laser is a free running pulse laser (FRP). Safety aspects to be aware of include as with all dental lasers, the potential to damage the eye through corneal damage at close distance (up to 20cm). Appropriate eye protection must be worn to avoid this. 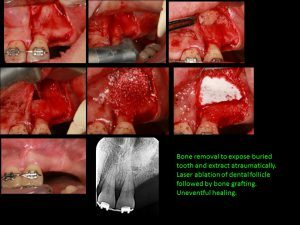 Generally, as long as the laser is used with the correct parameters, and therefore the correct educational training, damage to soft tissues through carbonization or necrosis, bone necrosis, root surface damage and pulpal damage is very unlikely. That said, the key is to use safe settings with water spray-mediated interaction to avoid damage. It is also safe and effective to use on implant surfaces with appropriate water, energy and time settings. It is not easy to cause harm on soft tissues as there is an abundance of water content. On hard tissues, lack of water spray would cause thermal side effects. Another possibility of harm would be through misguiding the laser light while it is on. The effect of Er:YAG laser is very superficial, which means a brief unintentional move on other tissues would cause de-epithelisation or surface modification. If the laser is held fixed at a point, removal of the tissue would of course become deeper. In the case of having too much power/high number of pulses per second/slow hand movement speed, tissue removal could be more than expected. An example could be during crown lengthening. The literature has reported effective use of this laser wavelength in both flapless and flapped periodontal pocket treatment. However, of course only end-firing tips are available to use in the pockets with this laser, and therefore delivery to the greatest depth of the pocket, and accuracy of how to deliver this laser energy flaplessly may be questionable. It may also be one explanation for results in the literature historically that did not show significant superiority of erbium lasers over scaling and root planing. With a flapless technique, the Er;YAG laser, just like the Er,Cr:YSGG, can be used to remove granulation tissue, inner and outer epithelium, calculus, biofilm, smear layer, endotoxin, and lipopolysaccharide, as well some biostimulation on bone. Once a flap is raised, it can do all the above, as well as decortication, removal or recontouring of bone, superficial decontamination and allowing easier access into furcation defects with visual feedback. Like the Er,Cr:YSGG laser, there is an Er:YAG protocol for the management of periodontal pockets known as Er:YAG laser assisted comprehensive periodontal pocket therapy (Er-LCPT). (Aoki et al, Photo-biomodulation laser strategies in periodontal therapy 2008). There is also a dual-wavelength protocol using both the Nd:YAG and Er:YAG lasers, commercially known as WPT (wavelength specific periodontal therapy). An animal histology study on dogs has demonstrated periodontal regeneration following use of an Er;YAG laser (Schwarz et al 2007). Essentially, all the procedures that an Er,Cr:YSGG laser can be used for, an Er:YAG is also effective. Speed of cut is fast. Ablating with an erbium laser has the advantage of minimal thermal damage to the tissues if used with appropriate water spray, and in most cases, operating with a bloodless field with little post-operative bleeding and need for sutures. However, this is where we see subtle differences with the Er:YAG, in that due to its higher absorption in water (3X greater than Er,Cr:YSGG), there tends to be more bleeding. With this in mind, be prepared for more oozing during a procedure, and the Er:YAG certainly wouldn’t be the laser of choice for any type of haemostasis or for the removal of blood-filled lesions such an haemangiomas. For the same reason, with the lesser penetration depth, it can take longer to excise tissue than the Er,Cr:YSGG, particularly the removal of fibrous tissue. Of course, an experienced operator can manipulate parameters accordingly to achieve a safe effective cut. Several soft tissue procedures can be performed with minimal or no anaesthesia. In terms of hard tissue surgery, then both erbium lasers are the ideal for the removal of bone. In terms of implant treatments, then again, we would group erbium lasers together in summarizing that they are safe and effective to use on implant surfaces. Flapless techniques for the management of peri-implantitis and peri-implant mucositis tends to be restricted to 5mm pocket depths or 3mm bone loss with an end-firing tip and Er:YAG laser. This is due to the limitation of delivery systems. 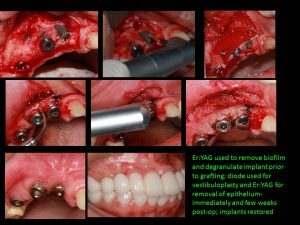 Surgical management of peri-implantitis, atraumatic extractions, socket preservation procedures, sinus augmentation, bone harvesting and implant exposure are all appropriate procedures to use an erbium laser for. The healing time of erbium lasers is the shortest amongst the dental lasers due to lack of thermal damage. The machines tend to be fairly easy to use, particularly as many come with pre-sets for different procedures. In terms of expense – the machines themselves are considered costly, but running costs tend to be low. Normally the only consumables you would need are the tips for the contact handpiece and the protective window for the non-contact. The tips for the contact handpiece do not wear down and can only be broken with vertical (patient moving their head sideways rapidly) or extreme horizontal (patient biting on the handpiece) force. The advantage of having an articulated arm to transport the laser light from the machine to the tissue is that it doesn’t get affected by the reflected light from the broken tip and the practitioner may continue to use it after getting the tip checked to see what percentage of the power is delivered through the tip. However, the disadvantage could be a little more difficultly in maneuverability. The windows of the non-contact handpiece are kept safe by having the focal point – working distance – far away (7-13mm). The arm itself doesn’t get broken as it is a steel tube. Servicing would be similar for similar devices. The learning curve is steep especially if the device allows modification of all possible settings with variability. It takes time to understand, experience and use all settings with predictable results on different tissues (inflamed/fibrotic, well vascularised/poorly vascularised etc.) Presets are usually middle of the range and safe; however real use of lasers is only possible with total control of the settings. Ease of clinical procedures: erbium lasers are simple to apply, no major difficulty except for lack of tactile feedback, which is not always needed with lasers. Time taken to carry out procedures: usually you need to take your time to be very precise etc however if speed is required it is possible to be at least as fast as conventional methods. The results obtained by incorporating lasers: has been very positive both by the patients and me. Patients love the experience with Er:YAG laser while I like the results even better. Increased practice revenue – if so – how/ why? 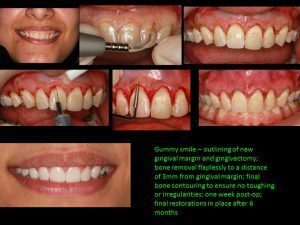 Definitely, increased patient satisfaction, word of mouth and profitability for the procedure that I carry out, like non-surgical perio treatment. Due to the similarities in the erbium lasers, all procedures that can be carried out with an Er,Cr:YSGG can also be carried out with an Er:YAG. The only difference may be in the availability of tips which may limit certain procedures. (View the Er,Cr:YSGG page for more cases).